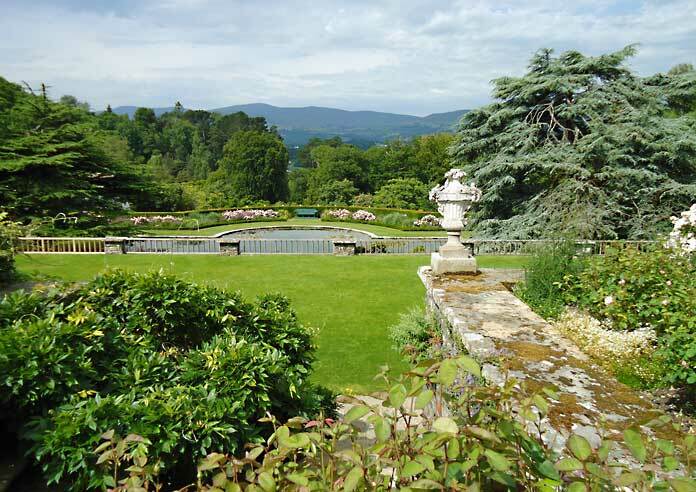 From my own personal experience Bodnant is beloved by coach trips of people “of a certain age” who come to see what they know as a “real” garden. 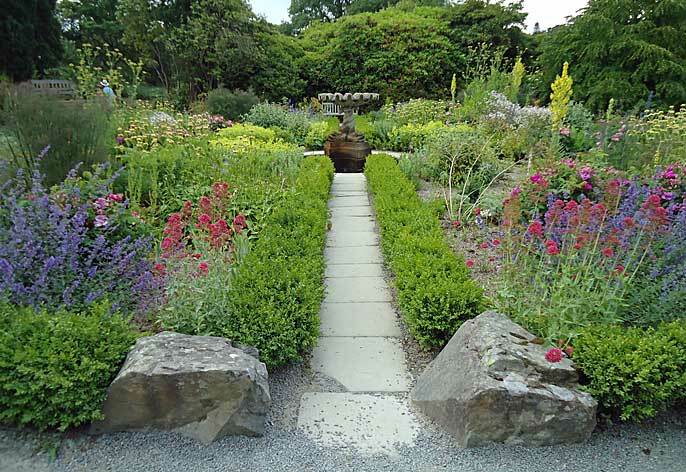 I was recommended to visit by the gardeners at Bodysgallen Hall which is only a few miles away. How could I resist someone with that kind of knowledge. An influential garden it maybe but a major topiary garden it isn’t but, hey, I’m broad minded enough to steal ideas from any quarter. The overwhelming impression is of a public park in one of Britain’s major cities, or rather one when I was growing up in the 1960’s when local authorities had plenty of money and weren’t cutting back on flower beds and had plenty of staff to manicure the lawns and rose beds. It is quite tranquil despite the hundreds of people milling about but when you consider it has to compete with the wilds of Snowdonia on its doorsteps it is actually quite twee. remember when you are planting low hedges someone (namely you) will have the back breaking work of clipping them into shape. Yes there are any number of power tools on the market but they can be heavy on the arms and you need a certain amount of delicacy to cut box hedges. So, that four miles of hedging you dream about may be a cut too far when in practice there is only you to maintain it. A word on box blight. I am reliably informed that one of the ways to keep the blighter at bay is to remove as many of the clippings as you can. In a large parterre with lots of inter planting this is easier said than done so you have been warned. 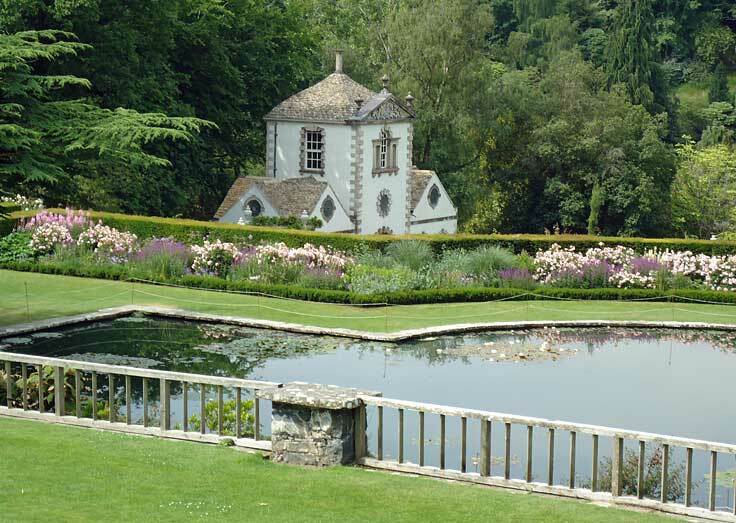 The Victorians loved their rockeries and exotic plants and Bodnant is full of such things. So much so that it looks a bit like a show with a series of different sections rather than a homogeneous whole, but maybe I am being a bit picky. 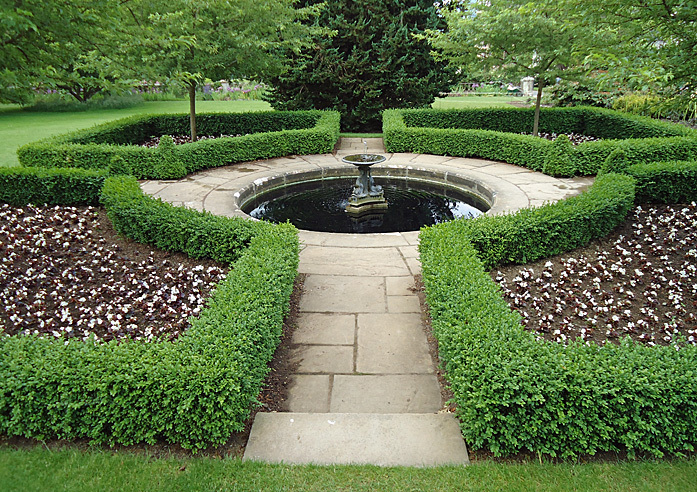 As I’ve said elsewhere on this site I think there is every place for roses and other inter planting in parterres or by hedges but I suppose I go for the more formal, or at least a garden with a whole plan. The Victorians of which this style belongs loved the more “natural” look, although of course you never actually get rockeries and rose beds in the natural world. My favourite parts, and of course you are welcome to have yours, are by the side of the house where you will find the terraces and the lake and the view of the Pin Mill Folly which is every inch something you would expect to find in a fairy tale. The yew hedges at the edge of the terrace set off the borders admirably and give a sense of linkage between one section and another. There are touches of a bygone age such as the yew hedges surrounding the flag stones of the rose garden with a classical statue that leads your eye along to see the backdrop of the woodland. Bodnant is large if you want to walk all the informal woodland acreageas well. If it is flower beds you want there are beds galore and there are lots of colourways set off by informal hedges for you to spot a plant, exotic or otherwise, or copy a theme for your own homely patch. So Bodnant is on here not because I don’t like the style but because I think there are many ways to use yew and box and all the other pantheon of the topiarists art and this represents another angle. 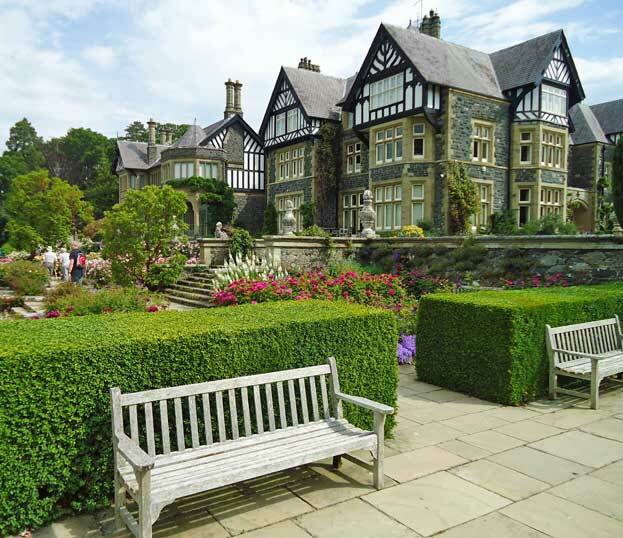 Besides many thousands get enjoyment from visiting Bodnant so they can’t all be wrong.